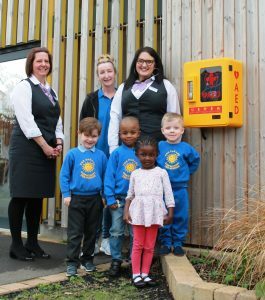 After three months of fundraising, a Portsmouth pre-school has installed a life-saving defibrillator in memory of a volunteer. More than £1,000 was raised for the device including £250 from The Co-operative Funeralcare in North End – part of the regional, independent co-operative, Southern Co-op. Parade Community Preschool, in North End, decided to raise the money to install the equipment after volunteer, Stephen Urry, died suddenly of a heart attack in November. Funeral Co-ordinators Emily Warden and Nicki Button spotted the appeal on Facebook and decided to get involved. Emily said: “We obviously come into contact with a lot of bereaved families and it just seemed right and apt that we get involved with this project. The school is local to us and the defibrillator will benefit our community. “The fact that the project came from one of the school staff losing her husband to a sudden heart attack really pulled on my heart strings. The defibrillator was installed in March and is also accessible to Northern Parade Junior School and the nearby Family Hub. The donation was made as part of Southern Co-op’s community engagement programme ‘Love Your Neighbourhood’ which addresses four key social themes – promoting greener, healthier, safer, and more inclusive neighbourhoods.